I haven't picked up a lot of the Sideshow Toy Civil War figures. Yes, I'm a fan of the line, and find the historical accuracy fascinating and exceptional, but when push comes to shove on the old toy budget, that's one area I have avoided. However, I recently watched Gods and Generals, the prequel to the excellent film Gettysburg. 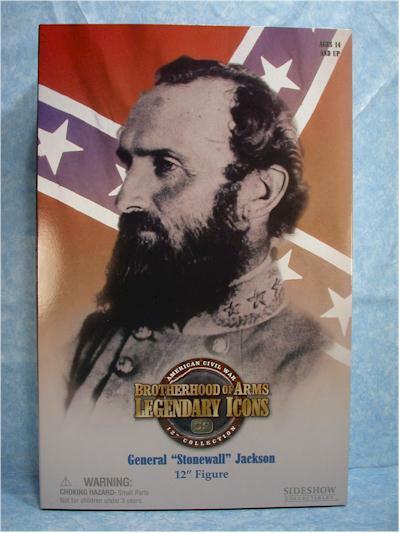 While not quite as good of a movie, it rekindled my interest in four figures from Sideshow - Colonel Joshua Chamberlain, General Robert E. Lee, General Jeb Stuart, and General Stonewall Jackson. The other three are available at the links above for pre-order, but Jackson has already sold out. I have a couple suggestions for on-line stores though at the end of the review where you can still pick him up. Suggested retail is $40. There's little or nothing to complain about with this style of Sideshow packaging. It looks fantastic, it stores easily, the figure can be removed and replaced without too much trouble, and there's even a decent amount of explainatory text. Overall, Sideshow makes some of the best sixth scale packaging on the market. This is another figure sculpted by the talented Mat Falls. Comparing the sculpt to photos, you can see the excellent likeness. The sculpt is a little soft though on the beard and hair, and some of the fine detail of the whiskers is missing. It's not a major issue, but it detracts slightly from what is overall a very nice job. The paint ops are predominately on the boots, gloves and head sculpt. All three are well done, although I was particularly impressed by the boots. The head sculpt shows some extra detail work in the paint application. 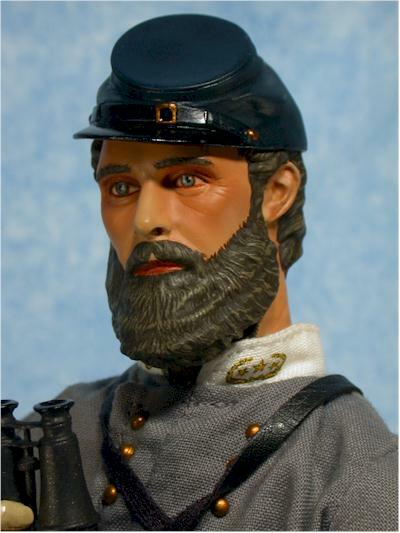 They've used two colors on the hair to give some highlights, and the edge of the beard on his face has some extra whiskers painted up onto his cheek. Although this doesn't quite give him the fuzzy look in the photo, it is a decent approximation. 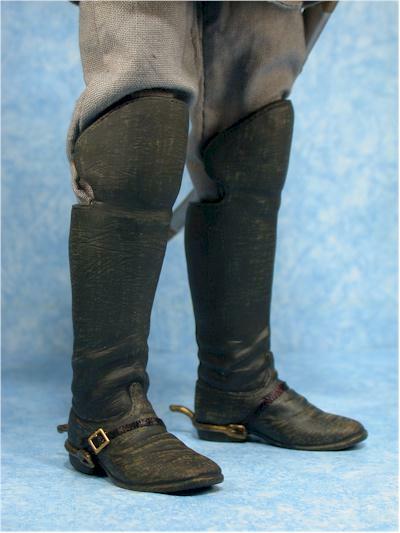 The gloves look realistic and weathered, but the boots really stand out. Using the paint, they've produced a weathered and dirty appearance that gives a truly realistic feel to his footwear. This is the usual Sideshow body, with all the articulation you'd expect - neck, ball jointed shoulders, cut biceps, double jointed elbows and knees, wrists, chest, waist, ball jointed hips, cut thighs and ankles. Obviously the boots and gloves cause a little restriction to the ankle and wrist movement, but overall this is one of my favorite 12" bodies. This one also had no trouble with looseness in the hips and joints, a problem I've had in the past with other Sideshow product. 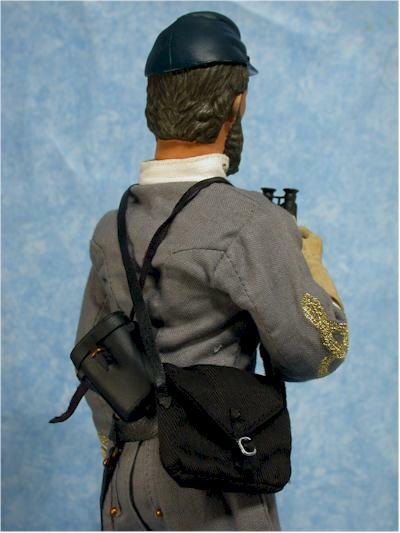 The accessory list is a little light for a figure this expensive - he has his sabre and scabbard that attach nicely to his belt, his binoculars and case, and his pouch. The sword and scabbard are the best of the accessories, and it attaches easily to the belt. It hangs great, and looks excellent. The cloth pouch is nice, and can be opened of course. The binoculars are well sculpted, but have a little trouble fitting inside the case. I would have liked a couple more accessories, such as a sidearm or rifle, especially at this price point. 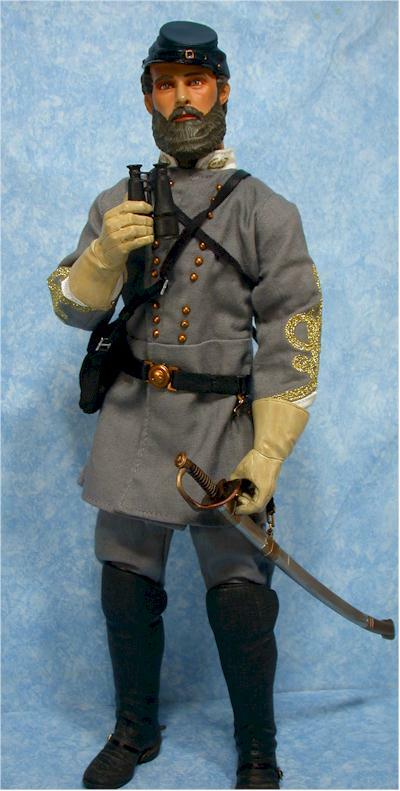 Jackson comes in a great Confederate uniform, that you'll recognize if you've watched Gods and Generals. All the detail work is there, including the stitching on the sleeves and collar. The tailoring on the pants and jacket is terrific, and the uniform fits this figure probably far better than the real thing fit Jackson himself. I mentioned the great gloves and boots earlier, but it's worth reiterating how good they really are. There's also a cap, belt, and spurs, all well constructed and nicely fitted. At forty bucks, these aren't a fantastic value, but they aren't too much more than you'd expect. With his limited number of accessories, you should try to find him in the thirty buck range if possible. 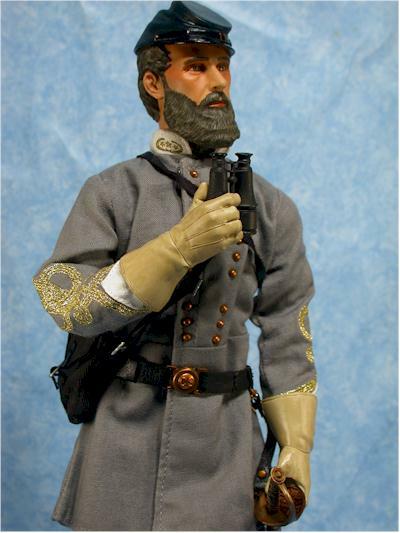 The big problem might be demand, since this is going to be a very popular figure with the Civil War buffs. It's been almost three months since my last Sideshow review! That's excluding guest reviews of course... I can't believe it's been that long. They continue to produce excellent figures, with great accuracy and detail. The price can be a bit much to swallow, but if you're a big Civil War buff, or if you are a big fan of either Gods and Generals or Gettysburg, you want to give old Stonewall a close look. I also just received Doc Holiday, and I hope to get a review of him up shortly. - I got mine from Aisle Sniper, where they are $33. They also have Lee available for preorder at $36. - Entertainment Earth has him in a mint box for $38, or in a damaged box for $35. When EE says mint, they guarantee it. Just search for 'stonewall'. Also, if you're into Sideshow and Buffy, they now have the new Buffy and Angel figures up for pre-order at the Sideshow site!